We did it! 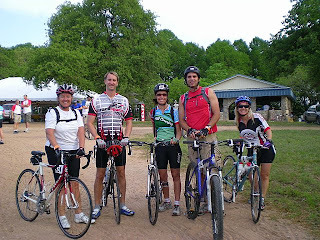 I finished all 50 miles of the 2008 Hill Country Ride for Aids on Saturday. This year it wasn't as easy as I remembered it....but, still just as moving and meaningful. I had a few Keller Williams folks join me this year, and next year am hoping for more. a time of reflection while riding to remember those with HIV or AIDS, to remember our supporters and those whom we ride to support. Thank you all for supporting me in the ride this year! Busy, overwhelmed, stressed, overloaded, disorganized? Agent? Coach? Everyone can use a Ms. Moss. I can not do it ALL. No matter how bad A I think I am, it simply isn't possible to accomplish it all in a day, a week, a month. When I try to do all that 80% work, the supportive work, the important work doesn't get done. MY JOB IS PRODUCTIVITY COACH. If you can't afford one, find someone to share the cost and time with. My Team Leader and I both needed a Ms. Moss. We didn't each have enough work to hire her full time, but we could afford, and did have enough work for one day a week! We also were able to share her with a few of our agents in the office! Ms. Moss has "purpose" again, she told me. And we have the help and love we need to be our best at taking care of our agents. This morning in addition to my affirmations, I also was re-reading the "Characteristics of Great Coach" from my Game Book for Productivity Coaches. Point number 2 is "Expect the best of each and every client and if they are not doing their best, a good coach will ask them to." And so is born my "question of the day." Are you doing your very best? My personality tends to tell rather than ask and I have been working very hard on CURIOSITY for the last few years. Both personally, and professionally. I have found that questions truly are more powerful than TELLING. And so I wonder, are you doing your very best? Do you know what YOUR very best looks like? What would it take to be one step closer to your very best? What standard do you hold your self to? Why would you be willing to live or be less than your best? What do you believe about yourself that keeps you from being or doing your best? If you are not living up to your best self, who in your life is it affecting? Of course it is all a balance. There is angst in not being your best. There is also pressure in not giving yourself grace to be human. Seek the balance in between of just being fully who you are at all of your potential. There is peace in that, I believe. To know at the end of the day, you have done your best...well, not a bad way to end the day. I have this little peeve.....around the office, people celebrate for a few OBVIOUS things: New Contracts, New Listings, and New Closings. New agents, and some experienced ones get envious and then discouraged because these closings and clients seem to drop out of the sky. It isn't the celebration that peeves me, but the often forgotten reality that those milestones were the results of many hours of hard work. This bring up the Law of ACCUMULATION once again. What agents need to celebrate is the daily little things that bring them closer to these big things. As Brian Tracy says, "That you have to put in many, many, many tiny efforts that nobody sees or appreciates before you achieve anything worthwhile." Once someone remarked that Amber Hart won, Rookie of the Year at our market center. I beg to differ. I watched Amber learn and discipline herself. Hours and hours of lead generation. MANY, MANY small efforts over time. Through THAT she EARNED that award. Each client you have is earned through small actions you put in to place many, many, months ago. Remember the lead turn around in this business is 90 days. The Lead Generation business doesn't suit those of us who thrive on "instant gratification." Put in those many, many tiny efforts. Recognise them for yourself, because most likely, no one else will see them. Trust that those tiny efforts will bring the worthwhile result. You are completely able to have ALL of the rewards and results you desire IF you are willing to put in the ACTIONS that will lead you there. Yes, the first step is envisioning it. The Law of Attraction is where it starts but with out ACTION it is just a day dream. Danci...I'm impressed by you this week too. Not long ago, you had a big deal fall out and you felt like giving up. I remember you saying that you just didn't feel like this business was for you. However, I had been receiving your Lead Generation reports EVERY Monday for some time. After getting out of fear and looking at the reports, we knew you were doing the work. I genuinely was able to tell you from 100% truth that your lead generation efforts would pay off. Sure enough those numbers are coming to fruition this Monday. Congratulations on your TRIPPLE! Not that you have to trust me to tell you...but when you do the work, and you track it, you have the evidence you need to KNOW that it will come. So trust the Accumulation. And if you aren't accumulating anything, you'd do well to go ahead and start now....because the contracts, listings and closings do not just drop out of the sky. He brought his cappuccino machine and is up here treating agents! Little things like the energy and interoffice contribution make a difference in where we work! What is your office like? If today you have clients, or contacts at the title company, or even a closing….that is a CONSEQUENSE of the lead generation you put in weeks, months, and most likely 90 days ago. If you have become so busy working your current clients, yet have not made time for daily lead generation, what will the consequences be weeks, months, and 90 days from now? Give yourself the gift of daily lead generation. You will enjoy the consequences of your efforts down the road. If you are NOW making those efforts, yet feeling frustrated or like it isn’t working….KEEP it up. IT WILL WORK….you will be able to reap what you are sowing today!